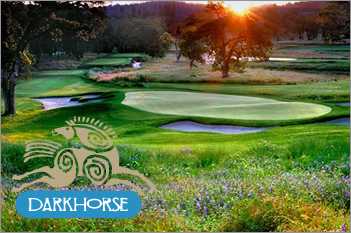 One of the finest courses built in Northern California in many years, DarkHorse lies in Auburn in the Sierra Nevada foothills, about 50 miles east of Sacramento. The course was laid out on what was once a 1,100-acre cattle ranch and features magnificent elevation changes. But there is much more than that for those who truly love golf. Holes were gently placed into the curving valleys on the site; the greens are subtly contoured; the bunkers are strategically placed and offer a variety of different shot making opportunities. Course Designer Keith Foster has crafted 18 unique holes that will leave you anxious to play DarkHorse again.